Every day at Select Sand and Gravel we provide different types of soil to customers for different applications. We strive to provide the correct material to the homeowner or professional contractor so that the delivered soil material makes the residential project or commercial jobsite work as easy as possible. Without the proper information it can be difficult to get the desired result. In striving to assist our customers with product selection this article is written to provide the average homeowner or contractor with a better understanding of the differences in soil. All soil is composed of Sand, Silt and Clay. These designations are simply an expression of the size of the soil particles of which they are comprised. Sand is the largest soil particle which is typically composed of silica and quartz. 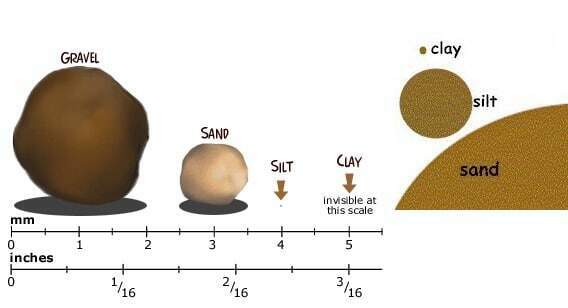 The next size soil particle is silt and the smallest size is clay. All of the soil delivered by Select Sand and Gravel is some combination of sand, silt and clay. The higher the sand content in a particular soil the more gritty that it is and the more easily water will pass through it. The smoother, more slimy a soil feels, especially when wet the higher the clay content. When we sell specific soils to customers for certain applications we want to provide a material that is the correct combination of sand silt and clay so that it has the desired effect for the project. When we provide specific soil to a customer for certain applications we want to provide a material that is the correct combination of sand, silt and clay so that it has the desired effect for the project. For instance if a homeowner needs topsoil for their front yard to grow grass but the existing soil has a high clay content we would not want to send a screened topsoil that has a high clay content. We would want to send a screened sandy loam that has a higher sand content to promote water drainage in the soil and thus grass health. Likewise, in the instance where a commercial contractor is trying to build a PAD site for a foundation we would not want to deliver sand to this customer. In so doing, we would be delivering the contractor a material that would not compact. We would want to deliver the contractor a select fill dirt that has a higher clay content more suited for the job. Select Sand & Gravel is a Sandy Loam, and Topsoil supplier. We specialize in dirt and topsoil delivery. In addition, we are a Crushed Rock supplier (see the article Titled, "Crushed Limestone Rock vs. Crushed Concrete Rock" for additional details on the differences of the types of Crushed Rock). Select Sand & Gravel is an excellent resource for Topsoil, Dirt, and Sandy Loam in the Dallas, Fort Worth, Austin, San Antonio and Houston areas. Click our Product Page for Topsoil, Dirt, Sandy Loam options. Please contact us at our office numbers for a free estimate or for any additional information.